As a hopeless golf tragic, I’ve always been passionately intrigued about golf’s colourful history. From the wondrous and mysterious origins of the game through to the romantic times of plus-fours and the featherie ball, I’m inextricably drawn to the “throwback” aspects of this great game. 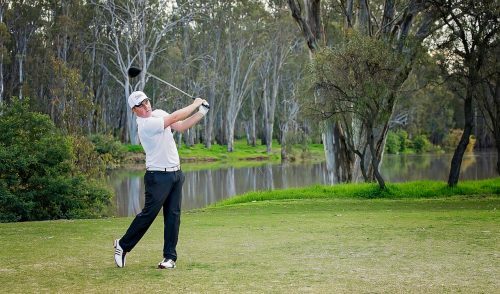 So when I was invited to play in a Hickory Golf Day last month at Yarra Yarra Golf Club, I jumped at the chance. 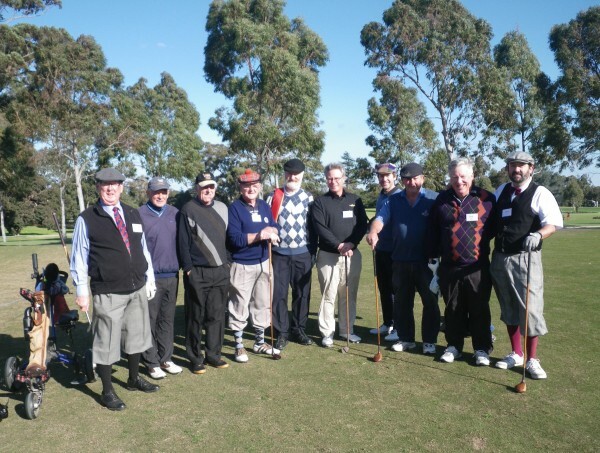 The event was organised and run by the Golf Society of Australia, a Golf Australia-recognized organisation whose mission is to research and preserve the history of golf in Australia. To that end, they run regular 9-hole “Hickory Heroes” events to boost interest in Hickory golf as a unique and fun way of playing the game as our forefathers did. Rocking up to the course in my plus-fours (hey, a guy’s gotta look the part! ), I was met by a friendly and affable bunch of players who were joining me in the day’s adventure. As I was handed my set of clubs for the day, I became giddy with excitement; immediately taking practice swings with clubs featuring names like “Play Club”, “Brassie”, “Mashie” and “Niblick”. This was going to be fun! Hickory Heroes at Yarra Yarra: Cliff George, Garry Powerlett, Max Findlay, Paul Burgess, Tim Groves, Tony Rule, Chris Vogt, Bill Young, Neil Walker, Richard Fellner. Now, most golfers will agree that golf is already a difficult game, even with today’s high-tech, graphite and titanium-powered weapons. But after just a few holes with a hickory-shafted club, I quickly discovered that playing with these wooden beauties can be infinitely more challenging (and humbling) than with any modern club. 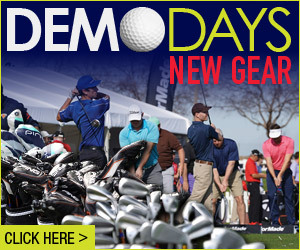 In order to successfully play with these clubs, it’s key to understand how they were made. 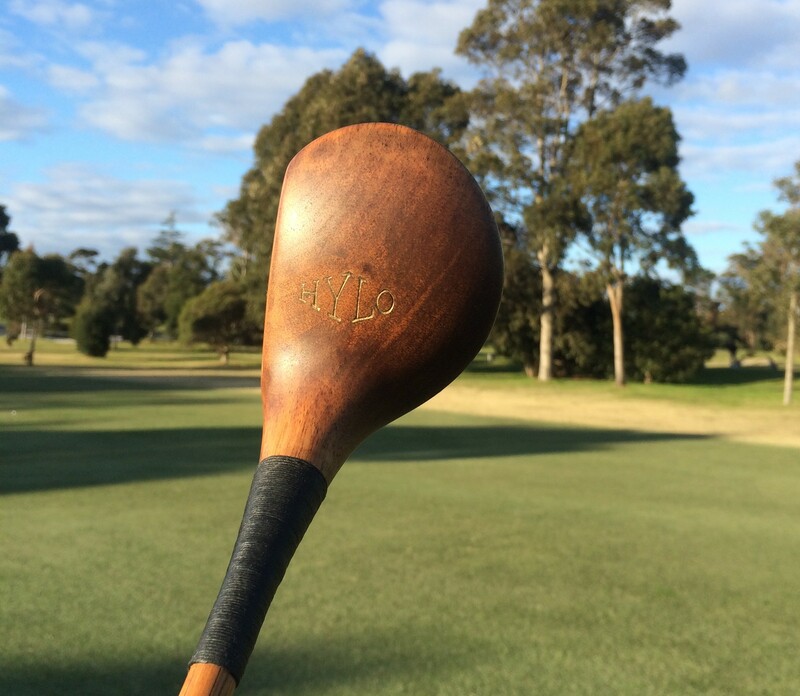 In the late 1800s and early 1900s driver heads were primarily made of hardwoods like maple, ash or persimmon. Each club was handcrafted – one by one—by the players themselves or by the local golf pro (Can you imagine what type of set you’d get if it was crafted by Inside Golf’s own Larry Canning?) The clubs had no standard shape or form (much like Larry himself), and thus the performance of each club varied tremendously. There was little or no consistency between clubs, and no standardisation for lofts (a Niblick built by one clubmaker could be quite different from a Niblick by another), so you’d have to play each of these clubs regularly to get a feel for their own individual “personality”. 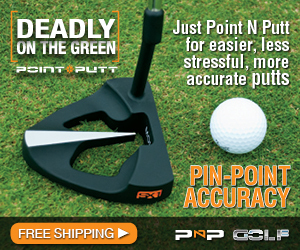 A typical driver clubface of the time could measure around 6cm wide by 3cm high—around half the size of today’s clubs. And the sweetspots were just that: a spot. There was brutally little room for error; miss the spot and you would lose the vast majority of distance and accuracy. Much like today, shafts of the day were key to a club’s playability. The hickory (and other wood) shafts of yesterday were a finicky bunch, and were highly vulnerable to the elements. Excessive heat, cold or moisture would often affect the club’s distance or performance, thus forcing some golfers to adjust their game dramatically depending on the day’s (or the hour’s) playing conditions. With all this to consider, the mind boggles at how players of the past were able to perform as well as they did. Understanding the limitations of yesterday’s technology gives one a greater appreciation for these historic heroes, and makes one contemplate how yesterday’s golf stars like Bobby Jones would compare (on a level playing field) to the big-hitting bombers of today like Rory McIlroy or Bubba Watson. The key to playing Hickory clubs, I discovered, is to swing slowly while sweeping the club back. The flex in the hickory shaft requires an extra split second at the top of your backswing to let the head catch up, lest you find yourself slicing all over the course. Hickory clubs are also generally heavier than modern clubs. Thus, a light and relaxed grip is recommended, allowing you to “feel” the heaviness of the clubhead through the swing. It took me a few holes to get the feel for playing these clubs. Off the tee, the extremely small wooden heads—combined with the “whippy-feeling” shafts—require the utmost concentration if you want to make solid contact. The tiniest of errors in your swing will often result in a topped or duffed shot. But when you hit it pure, the pleasing sound of the wooden “crack”—matched with the soft and springy feel off the face—is absolute heaven. 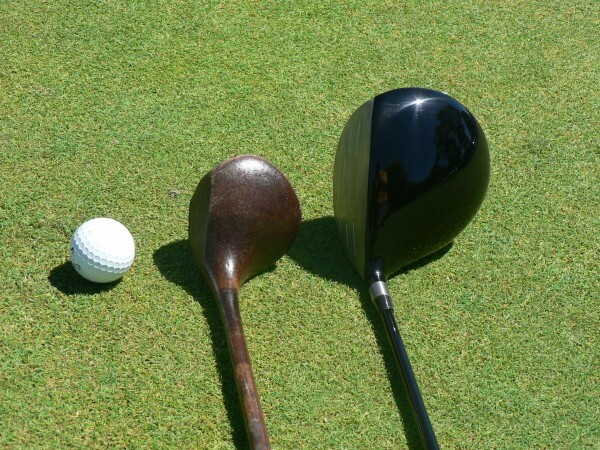 In truth, a good hit with one of these clubs can feel far more satisfying than with any modern club. As for the irons, the extremely thin heads and heavy soles made them felt unwieldy at first—especially off tight lies. And even a pure contact had a distinctly “hard” feeling to it. But once you get the hang of it, they are a pleasure to play. Approach shots are where a hickory club can really be a challenge, as determining your yardages can take a few rounds for the beginner to sort out. With no standardised lofts or club numbers, a Mashie-Niblick (7-iron equivalent) might only carry as far as one of today’s wedges. Thus, as my round progressed, the tiny sweet spots, paired with the inconsistencies between the clubs (as well as those within my swing itself), generally saw me either leaving my approaches 20m short, or flying 40m over the back…with the same club. And you can forget about getting any consistent backspin or stopping power, even with modern golf balls (note: we were playing with soft-feel balls, as they tend to perform best with these clubs). As for playing from the sand, it’s best to avoid the situation altogether, if possible. Escaping a bunker can feel akin to breaking out of a maximum-security prison, as the thin leading edge combined with the lack of bounce on the sole causes the club to dig deeply into the sand. But with a little practice, popping the ball out of the bunker can become slightly less frustrating. When you’re on the green, it’s a new adventure altogether. After four-putting the first few greens (! ), I discovered that success on the green is all about matching the right club to your stroke (some heads are made of steel, others of wood, with many having upwards of 10 degrees of loft) , and then practising a LOT to get a feel for your flatstick. On this day, the Golf Gods (in typical fashion) decided to save some of my best strokes for the last two holes. 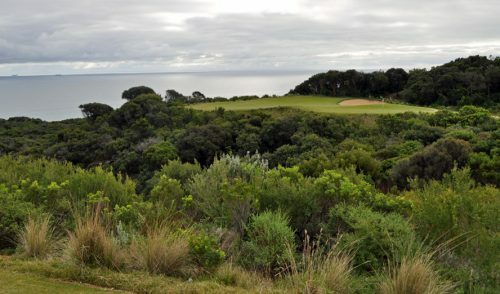 With a few tee shots smashed down the middle, followed by a few stiff approaches, I had finally settled into my groove, and I found myself laughing and smiling from ear to ear with each strike. In short, I was hooked on Hickory. 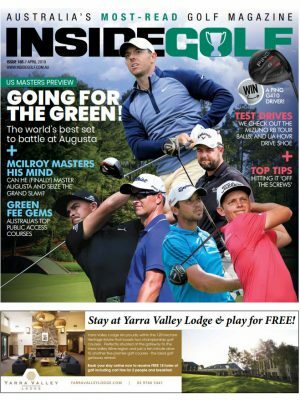 The Golf Society of Australia run regular “Hickory Heroes” events in Melbourne, and I highly recommend that you check one out. 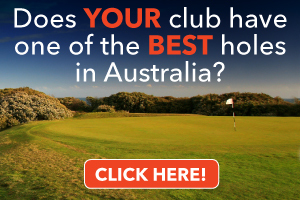 For more information, check out their page on the Golf Australia website. “Par” wasn’t the original term for measuring the preferred number of strokes. Instead, “Bogey” was the target score. “Going round in bogey” was the common phrase for even-par in England in the 1890s, based on the song “Here comes the Bogey Man”. Players were said to compete against “Colonel Bogey”. As golf developed, scores soon dropped, and with a push for standardisation in the US, the term bogey was changed to one-over-par. 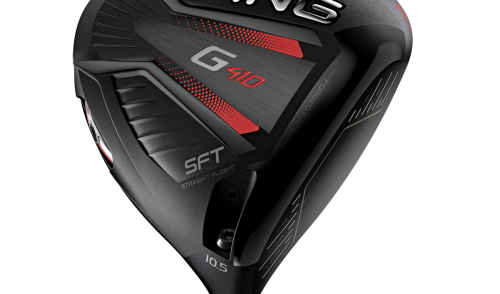 Today’s golf clubs are more forgiving than ever before. When the USGA tested a wooden driver on their Iron Byron swing machine – and set it to deliberately hit the club off-centre — the ball travelled 45 yards less than when hit purely. Conversely, when the same off-centre test was done with a titanium driver, the ball flew only 10 yards less than a properly-hit ball. In the early days, as the Church frowned on golfers having a hit on the traditional “day of rest”, many eager golfers are said to have carried “Sunday Sticks” (aka Sabbath Sticks). Cleverly disguised as simple walking sticks — with the clubhead fitting in the palm of the golfer’s hand — the golfer simply wandered into a field or onto the links, waited until no-one was looking, then quickly reversed the stick and had a hit. Brilliant! The first recognised balls were made of wood in the early 17th century. These eventually gave way to the Featherie Ball, which was a hand-sewn leather pouch stuffed with feathers. And they didn’t use just a few feathers, mind you, they crammed enough feathers in there to fill a top hat. The ball was then boiled and put in a cowhide bag. As it cooled, the feathers expanded while the hide shrank, resulting in a compact and solid ball. Though they flew better than wooden balls, they were far from perfectly round and they had a tendency to fly irregularly. Like the clubs of the day, the featherie also had issues in wet weather (the stitches would rot) and the ball could split when hitting hard surfaces. They were also not cheap. Each ball would sell for between 2 and 5 shillings — the equivalent of $8 to $17 today. The featherie was the ball of choice for over 200 years until the gutta-percha ball was invented in 1848. Created from the dried sap of a Sapodilla Tree, it was cheaper to make, had a rubbery feel and could be shaped by heat. Interestingly, ballmakers soon discovered (by accident) that little nicks and scrapes actually improved flight characteristics of the ball – and thus they began to intentionally hammer little dimpled patterns into the ball. Thus was born the now ubiquitous dimple.